When traditional tactics for hunting coyotes prove to be unsuccessful, switch gears and try some methods used by deer hunters. Predator hunting has its highs and lows, putting hunters in constant states of success or head-scratching frustration. When the usual tactics don't work to locate and call coyotes, try some of these tactics used by deer hunters to put more fur on the ground. Stand-hunting, under the right conditions, can be effective for coyotes. The technique is the same as that used by deer hunters — set up near a well-worn trail and wait for a coyote to wander by. The two main keys are: finding well-traveled coyote paths and getting on the stand early. 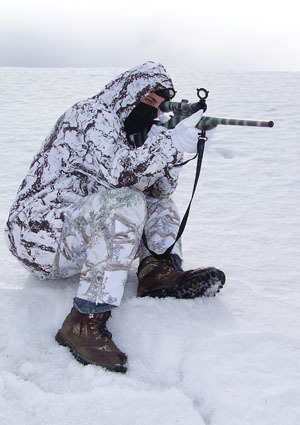 Stand-hunting is best employed in the heavy cover between feeding and bedding areas. Your setup location should allow you to ambush coyotes as they travel between the two. In heavy cover, movement is much more concealed than in the open. However, stand hunting can be successful in the open, if you hide your movements with available cover while traveling between stands. You might have to crawl through short vegetation like a sniper, moving only inches at a time. Stand-hunting works best on windy days. Constant attention to wind direction is essential as it dictates not only where you set up in relation to travel corridors, but also the direction you travel between stands. Always set up and travel into the wind. Try to keep the sun at your back. Coyotes have a harder time seeing you if forced to stare into the sun. Successful hunting requires a significant amount of scouting to pattern call-shy coyotes and plan your path for the day. Fortunately, coyotes have routines that allow for patterning. These routines vary during certain times of the year, but if you choose those times of the year when the coyote's behavior is fairly habitual, you can often predict its behavior and location. Determine paths from feeding to bedding grounds, but do so at a considerable distance from your potential stands. Spending too much time near ambushing sites could tip-off the coyote, alter its pattern and ruin your hunt. As it is for deer hunters, a trail camera with a time stamp can be a huge asset. Allow the area to cool off by waiting several days between scouting and hunting. When you arrive at the stand, get in position and take a few minutes to range the terrain with a rangefinder. Range the path where you expect the coyote to pass, as well as other prominent features, in case the coyote's approach does not go according to plan. Do this ahead of time. You won't have time to range the coyote as it approaches. Another effective big-game hunting tactic, spot-and-stalk, can work for coyotes. In moderate cover to open country, it's not as difficult as it sounds. Good binoculars are a must. The spot-and-stalk method works particularly well in mid-December through mid-February when coyotes are traveling broadly in search of mates and aggressively patrolling their territory for intruders. During the snowy breeding season, find an elevated position to scan for distant coyotes. If fresh snow is covering the ground, search for fresh tracks. You might be able to follow the tracks to a feeding or sleeping coyote. Spot-and-stalk hunting can be effective during midday. Coyotes often sleep during the day near the tops of hills where they have good views of the surrounding area. They're not heavy sleepers and frequently awaken to scan for danger. Since coyotes are not often pressured during midday, they often let their guard down a bit, giving the hunter an advantage. The key is to move slowly, stay under cover, and glass, glass, glass. In harsh winter environments, coyotes sometimes prefer to hunt during the day as the softened snow makes hunting rodents easier. They will stay close to cover during these times, not only for safety, but because prey is typically found there. Look for coyotes on the edges of brush cover if none are spotted napping on hilltops. Remain out of sight. Keep a low profile. Watch the wind. Stalk downwind or crosswind of the coyote once you spot it. Remain quiet. If the snow is crunchy or dry leaves make your step loud, you might want to forgo stalking in favor of a stand. Stalk only close enough to make a high-percentage shot. How close depends on your shooting ability and your gun's accuracy. Stalk as close as your shooting confidence allows and not one step farther. Practice shooting, know your limitations, and fight the desire to move just a little closer. Calling through high winds can be unproductive, but a spot-and-stalk hunter can use heavy wind to his advantage. The wind covers the sound of movement and blows scent away from the coyote. Think like a coyote. In high winds, especially in winter, coyotes head for shelter, which might be as simple as the leeward side of a hill. Enter your hunting area so that you're staring into the wind, and walk slowly scanning for sleeping coyotes on the leeward side of any sheltering feature. When you spot one, stalk as close as you dare, while remaining out of sight. Circle the coyote's position until you're perfectly downwind. This allows you to avoid having to compensate for wind deflection. Find a position where you can make a good, clear shot from a solid rest, and make the first shot count. Unlike spot-and-stalk, jump-shooting is simply traveling through good coyote territory until you bust one. Jump-shoot hunting all too often occurs as a result of being spotted while traveling between stands, so always be ready for a jump shot. It is nervewracking but fun, and requires only a gun and plenty of ammunition. A variation of jump-shooting involves pushing coyotes toward another hunter, in a manner similar to a deer drive. This can be done with as few as two hunters, but is more successful with larger groups. One or more drivers kick up a coyote and funnel it toward the waiting shooter. The hunter must then shoot the coyote on the run or try to stop it for the shot before it's out of range. Only push the coyote hard enough to drive it toward the shooter. If the drivers crowd the coyote too much, it might not slow down in time for the shooter. One way to ensure that the coyote slows in time is to place the shooter at a sufficient distant from the drivers. If hunting in groups, jump-shooting (deer hunters call it "driving") can be successful any time of day on any day of the year. Jump-shoot hunting without partners tends to be more productive during midday when you are more likely to encounter a coyote snoozing, as well as throughout the late-summer harvest when farm implements cover the hills. During this time, I sit in scrub brush on pieces of land that can't be farmed and wait for the combines and trucks to push coyotes toward my position. The action can last the entire day.